Summer is a time of journeying for many of us--we take time away from work and school and often we want to go somewhere new and try something different. I celebrated the beginning of summer with a weekend trip to Westport, on the edge of the beautiful Clew Bay in the Northwest of Ireland (for my US friends). We went for an outdoors adventure, cycling the Great Western Greenway--a 42 Kilometer path over now unused rail lines, carrying walkers, hikers and bikers across some of the most stunning terrain along the Wild Atlantic Way. The following day we climbed Croagh Patrick, a 2500ft mountain that dominates the landscape around Westport. It's name means "the Stack of Patrick", the patron saint of Ireland who, according to tradition, prayed and fasted on the mountain in 441AD. It has long been a place of pilgrimage for Catholics, especially on the Last Sunday in July, when thousands climb together, many of them barefoot (more on that below). I wasn't climbing as a Catholic pilgrim--the climb has become, like the Camino in Spain an experience many are interested in regardless of any religious affiliation--nevertheless, it became a pilgrimage of sorts. 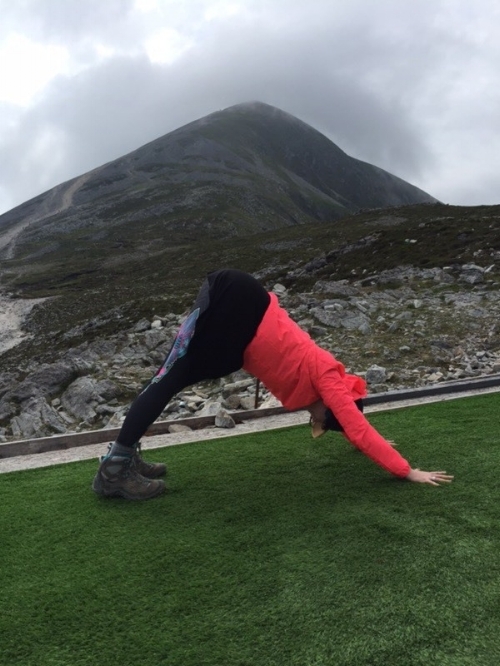 While Croagh Patrick is not the highest of mountains, it's no walk in the park and I was surprised at how challenging it was, especially final assent to the summit, which is very steep. I hadn't thought too much about it beforehand and just thought, "people do this all the time, it'll be fine." However, I neglected to fully factor in my fear of heights and when I saw what lay before me in the final third of the climb, I honestly thought I’d give up before I'd reach the peak. As I negotiated my fears I reflected on how it's a good idea to remember that what may be "easy" for others is not necessarily so for you and that you must take each challenge on your own terms and not compare yourself to others. Although, many people do it more quickly, it was a near two hour climb to the peak because on that final part of the climb, I paused a lot to breath and reassure myself that I could feel into my feet and find my balance! I kept reminding myself that I had heard the voices of "I can't do this" many times before on the yoga mat, and many times I had used mindfulness of breath and body to remain steady and make a wise choice as to whether it was indeed appropriate to keep going past my comfort zone and try an "advanced" pose even when I was intimidated or whether to pull back from my edge because my body wasn't yet ready for a deeper version of a pose. I have applied the same principles in my life off the mat when facing difficulties and this situation was no different. I gave myself lots of time and space to decide whether leaning into the difficulty was coming from a place of embracing challenge and growing my edge or a place of forcing myself to meet some artificial standard of what I was "supposed" to be able to do--in my experience the latter can get you only so far and then you often bump up against a wall of overwhelm and collapse in a frustrated defeat, or worse, force yourself into a place of injury. Either is a form of suffering. My mantra lately, taken from a talk I listened to from Judith Hansen Lasater, is "Embrace the Challange, Drop the Struggle." When I didn't give myself breaks and kept pushing up, I could feel my legs getting more and more shaky and then I knew I was struggling, so I stopped and gave myself full permission to either discontinue or continue when I had taken some breaths and found my feet. Continue or discontinue without judgment or reproach. Time and space to make a wise choice from a place of love and appreciation of myself. Was it appropriate to further embrace the challenge or was it wise to turn around and try again another time? And I have Yoga to thank for teaching me the joy of Legs Up The Wall --the perfect pose for the summit rest before the descent. Do your best, then put your feet up! For me, this experience is a good metaphor for life: the mountains are there, let's not run away from them just because they look steep and we feel fear. Fear is not unworkable. We can always use mindfulness and kindfulness to work with our fears. We can give it a try, and we might grow the edge of our comfort zone. However, wisdom will remind us that may not get to the top on the first go, and so we allow full permission to take breaks and discontinue something when it no longer feels like a feasible challenge and feels more like an overwhelming struggle. Take a break and try again another time. No harsh criticism, no comparison--and when the trying is over, don't forget to put your feet up and appreciate your efforts. And as for doing the climb barefoot, my feeling is this: life is always bringing us challenges that we cannot necessarily opt out of and that's why we PRACTICE yoga and mindfulness--for when the non optional challenges arrive--so we do not need to add onto the challenge, or as my teacher Katchie always said "don't make it worse!" The Buddha said, suffering that can be avoided, should be avoided. Those of you who know me know I'm obsessed with feet, thanks to my other dear teacher Stacey, and I am always preaching the Liberation of our feet from tight shoes and going barefoot when we safely can, but please, please, please, wear hiking boots when climbing a mountain (and take that both literally and metaphorically). The mountain rescue teams will appreciate it too! I hope you take a metaphorical pilgrimage of your own soon. Why not make your journey to your yoga mat/meditation cushion a regular pilgrimage? I recently encountered a self-proclaimed critic of mindfulness, and what I found was that the person's critique was based on a misunderstanding of the teachings. This is in itself understandable because mindfulness has become a hot topic, a buzz word—it’s everywhere and unfortunately there are some people speaking and teaching about mindfulness who do not seem to be grounded in the practice or in the wider teachings from which mindfulness comes. Mindfulness come from the teachings of the Buddha and has been tried and tested for approx 2600 years in that tradition. It's worth exploring these wider teachings and seeing what they contribute to the practice and understanding of mindfulness. I’m not claiming to be an expert, but I have been practicing mindfulness Meditation for close to 10 years and have been specifically trained in Mindfulness and Yoga. I say this not to blow my own trumpet, but rather to say that I have been lucky enough to have spent a lot of time with some wonderful teachers who have shared the richness of the Buddha's teachings. Because I feel so grateful for the healing the teachings brought into my life, I’d like to offer some thoughts on the subject with the hope that those who may otherwise be turned off by confusions regarding mindfulness might be willing to explore afresh. Equally, i'd like to dispel any confusions that any new practitioners this blog may reach might feel. WHAT DOES YOUR LEAP LOOK LIKE?